1 Combine dressing with chipotle chile pepper in small bowl; reserve 2 tablespoons. 2 Pour remaining dressing mixture over cod in large resealable plastic bag; turn to coat. Close bag and marinate in refrigerator 30 minutes. 3 Meanwhile, combine Hellmann's® or Best Foods® Real Mayonnaise, lime juice and 2 tablespoons reserved Dressing mixture in medium bowl. Stir in cabbage and cilantro; chill, if desired. 4 Remove cod from marinade, discarding marinade. Grill or broil cod, turning once, 15 minutes or until cod flakes with a fork. 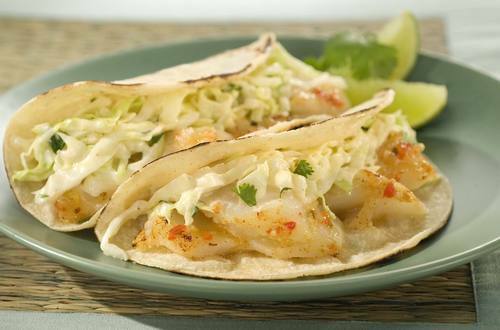 To serve, arrange cod in tortillas, then top with cabbage mixture.